People who have a branchial cleft cyst are born with the condition, which begins in early in the embryonic stage. Though it is present at birth, it may not be recognized until adolescence among those who have this condition. 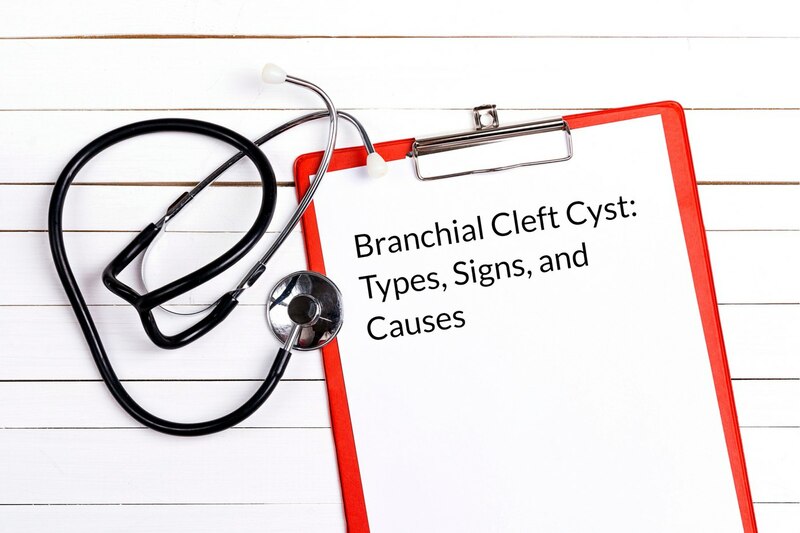 The better you understand the branchial cleft cyst condition, what causes it, symptoms to look for, etc. the better prepared you are to seek the right type of medical care for a child that presents with these symptoms. What is a Branchial Cleft Cyst? The branchial cleft cyst, sometimes also referred to as branchial cleft remnant, presents as a lump on one or both sides of the neck or below the collarbone. This area of the neck is referred to as the branchial cleft. The birth defect often appears as open spaces, or cleft sinuses. When fluids drain from the sinus, cysts often form. In some instances, they can become infected. When it comes to branchial cleft cyst causes, there is one primary culprit. The gill-like structures in the baby’s neck, which usually reabsorb during early embryonic stages around the fifth week of embryonic development, fail to do so. When this fails to happen, a variety of defects in the neck may occur, including one known as branchial anomalies. Branchial anomalies may appear as cysts or lumps at birth or when they become enlarged, at a later time, during an upper respiratory tract infection or after one has occurred. There are essentially four different branchial cleft cyst types to be concerned with. The second type of branchial cleft cyst types accounts for the majority of all cases of branchial cleft cysts, making the remaining three quite rare. One of the rarer forms of branchial cleft anomalies, the first branchial cleft anomaly occurs above the hyoid bone, sharing a close relationship, anatomically, with the facial nerve. Cysts typically appear around the earlobe or along the jaws. First branchial cleft anomalies are rare, accounting for fewer than one percent of all branchial cleft anomalies. While they are extremely rare, they are also often misdiagnosed, partly because of their rarity, according to the National Journal of Maxillofacial Surgery. The most common type of branchial cleft cyst, accounting for more than 95 percent of all branchial cleft anomalies, is the second branchial cleft sinus. When this occurs, sinus tracts open in the lower part of the neck extended as far as the area of the tonsils. These types of cysts typically appear after your child is over the age of 10, most commonly arising between the ages of 20 and 40, though they may present in infants and children under the age of five as well. Another rare form of branchial cleft cysts, third branchial cleft cysts often present during childhood, according to the American Journal of Neuroradiology, and seem to prefer the left side (accounting for 97 percent of cases). This cyst lies posterior to the internal carotid artery, located with the hypoglossal nerve beneath and the glossopharyngeal nerve above, with most lying in the posterior cervical space behind the sternocleidomastoid muscle, according to Radiopaedia. Third branchial cleft sinuses cysts are mostly located near the thyroid gland in the front part of your muscle that attaches to the collarbone. These types of branchial cleft cysts are extremely rare. Part of this is that they are very rarely recognized. In fact, only approximately 30 cases of fourth branchial cleft cysts have been discovered and reported, according to the American Academy of Otolaryngology-Head and Neck Surgery. These cases, often after having been misdiagnosed for years and after patients have undergone multiple unnecessary and unhelpful medical procedures. Most cysts, with this type of branchial cleft cyst, occur below the neck, and 80 percent of them are located on the patient’s left side. For the most part, branchial cleft cysts are small enough that they present few, if any, problems to the person living with them. On some occasions, they may enlarge sufficiently to cause patients with difficulty breathing and/or swallowing. Small lump or mass on the side of the next. This is usually on one side of the neck, though in rare instances it may appear on both sides, near the front edge of the sternocleidomastoid muscle. For the most part, the cyst is painless unless it is infected. Small opening or dimple in the skin where mucus or fluid drains. Like the lump or moss, the dimple or opening is commonly located near or along the front of the sternocleidomastoid muscle. Tenderness in the neck. This can especially occur during or immediately after an upper respiratory infection. Fluid draining from the neck. This may accompany swelling in the neck. You should note, however, that these symptoms may vary from one child to the next and they are very similar in nature to many other neck abnormalities and medical problems. You should always consult your ear, nose, and throat physician when troubling symptoms, like these, appear – especially when they involve young children and adolescents. If you suspect your child may have branchial cleft cyst, or you notice a draining pit on your child’s neck or around his or her ear, it’s wise to schedule an appointment with an ear, nose, and throat doctor to discuss the possibility of this condition and to avoid the potential of developing infections, which are quite common among people who have branchial cleft cysts. The purpose of this examination is to search for signs or symptoms of branchial cleft cysts. Your Houston ENT doctor may follow up with an ultrasound exam. In some cases, a CT scan or MRI (magnetic resonance imaging) scan may be ordered instead or your doctor may choose to conduct a biopsy or a fine needle aspiration of the fluid to examine the fluid further. Once a diagnosis is made, your ENT physician will discuss with you whether treatment is warranted or recommended. Your child’s doctor will discuss treatment options with you. Treatment is only necessary when your child experiences persistent episodes involving drainage or frequent infections. You should seek emergency services whenever the symptoms of a branchial cleft cyst interfere with your ability to swallow or breathe. Please take a look at our other article: Branchial Cleft Cyst Treatment Options. And, if you have further questions about Branchial Cleft Cysts, please contact us here at Houston ENT & Allergy Services at 281-623-1312 or complete our online form.